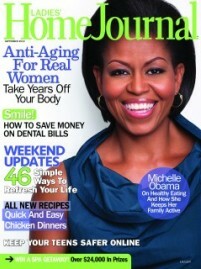 First Lady Michelle Obama has started a nationwide nutrition initiative called Let’s Move. Michelle Obama is promoting healthy eating habits for Americans by encouraging balance. She is encouraging us to balance fruit and veggies on our plates and exercise portion control. Obesity is out of control in the US and the First Lady believes that in America, we possess the power to tackle any problem, including what we eat. Michelle Obama says she benefits from a vegetable cleanse now and then but still enjoys a dessert once in a while, as a treat. When asked by Ladies’ Home Journal what made her choose Let’s Move as her first major initiative, Michelle Obama said, “It’s personal for me. As a working mom I lived through what a lot of working families are dealing with: You have your job. Your kids are going in 50 million different directions. You’re trying to fix dinner, doing things on the go. You’re eating out because you don’t have time to cook,” she said. Besides watching what she eats, she gets up very early and hits the gym.